"One of my goals as a teacher is to open the eyes of children and their parents to the beauties of great music." My string quartets and I have performed for over 700 weddings, receptions, and corporate functions. I have played for over one thousand orchestral functions and church services and have contracted musicians for numerous churches. 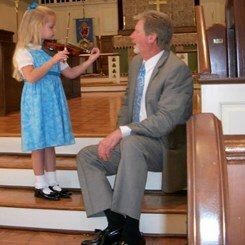 I have been a private violin teacher in the Atlanta area since 1983. I hold a bachelor of music degree from the University of Southern Mississippi, have completed teacher training in all ten volumes of the Suzuki Method, and have completed numerous supplemental courses under the auspices of the Suzuki Association of the Americas. Over the years I have taught thousands of young people. Many of them of have advanced to positions of leadership in their school orchestras, gained admission to youth symphonies all over the metro area, and have been accepted into university music programs. I teach students of all ages and am happy to accept kids as young as three and a half. I would love to teach your child! Request Lessons with Paul David Hedman today!